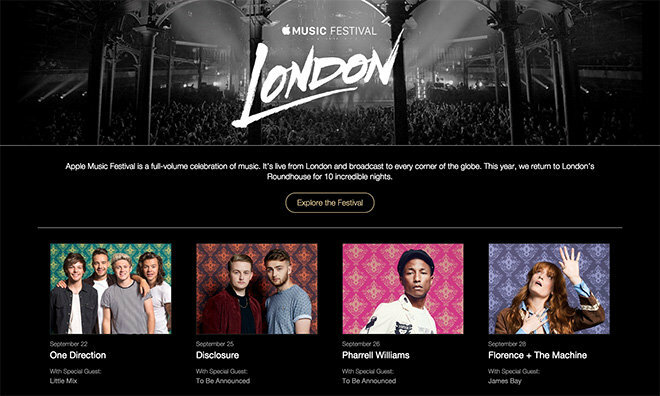 Apple on Tuesday local London time announced start dates for its upcoming UK-based Apple Music Festival, née iTunes Festival, as well as an initial set list including headliners Pharrell Williams, One Direction, Florence + The Machine and Disclosure. The newly minted event is scheduled to take place from Sept. 19 to Sept. 28 at London's historic Roundhouse theater, which has for years served as the festival's main venue. Announced dates have One Direction playing on Sept. 22, Disclosure on Sept. 25, Pharrell on Sept. 26 and Florence + The Machine on Sept. 28. "We wanted to do something really special for music fans this year," said Apple SVP of Internet Software and Services Eddy Cue. "The Apple Music Festival is a greatest hits set of ten unbelievable nights featuring some of the best performers on the planet appearing live and interacting directly with their fans on Connect and Beats 1." As noted by Cue, the festival has been trimmed down to ten days, as opposed to the usual 30-day marathon seen in years past. It appears that Apple is making the most of its Apple Music branding, as users can tune in to Beats 1 for official coverage and follow a special Apple Music Festival page on Connect. Those who subscribe to the special account via iTunes or Music app for iOS will be privy to future lineup updates, announcements and exclusive behind-the-scenes photos and video from the event. As always, tickets are to be doled out through media partners in the UK, including the London Evening Standard. In the past, fans in the UK were able to enter drawings through the iTunes Festival app, but Apple is transferring that responsibility to the Music app for iOS in 2015. The festival will be available to stream via Apple Music or iTunes on iPhone, iPad, iPod touch, Mac and PC. Apple TV owners are also getting access to high definition set replays, though there has been no word on live performances.